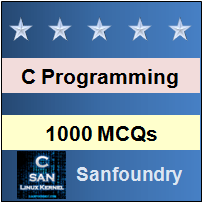 This set of C Multiple Choice Questions & Answers (MCQs) focuses on “printf – 1”. 1. The syntax of printf() function is printf(“control string”, variable list) ;what is the prototype of the control string? Explanation: The prototype of control string is %[flags][width][.precision][length]specifier. Each control string must begin with % sign. Explanation: After the control string, the function can have many additional arguments as specified in the control string, this parameter contains the text to be written on to the standard output device. 3. Output justification such as decimal point, numerical sign, trailing zeros or octal are specified. Explanation: Flags specify output justification such as Left-justify within the data given field width, Displays the data with its numeric sign, used to provide additional specifiers like o, x, X for octal, left padding of a number. 4. What symbol is used to Left-justify within the data given field width? Explanation: To left-justify the data use minus sign(-) in the flags field. 5. What specifies the minimum number of characters to print after being padded with zeros or blank spaces? Explanation: width specifies the minimum number of positions in the output. Explanation: Precision specifies the maximum number of characters to print. 7. ________is used to define the type and the interpretation of the value of the corresponding argument. Explanation: Specifiers is used to define the type and the interpretation of the value of the corresponding argument. Example: c for a single character, d for decimal values etc. Explanation: The conversion specification %7.4f means that it will print floating point number maximum of 7 digits and 4 digits after the decimal point. 9. Choose the correct description for control string %-+7.2f. Explanation: The given control string %-+7.2f means that – is for left justify, + to display sign, 7 specifies the precision and 2 specifies the width. 10. What error is generated on placing an address operator with a variable in the printf statement? Explanation: Placing an address operator with a variable in the printf statement will generate a run-time error.